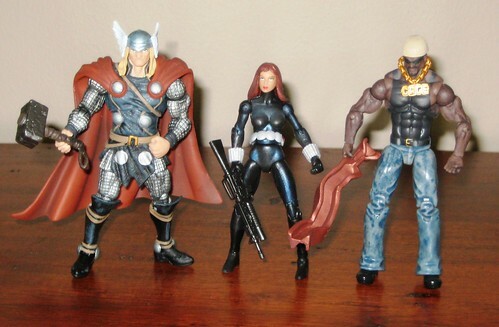 Hasbro continues to pump out the figures in its Marvel Universe line, and amongst the latest half dozen IronSpideyrene variants, there are a couple of new characters and a relevant new version of one that's already been done: Luke Cage, Black Widow and Thor (Modern). Thor is the pick of the bunch. Great amount of detail in the modern costume, which I quite like. The face isn't a huge improvement over the Secret Wars version - the nose is a tad too big, but this is a good looking figure for the scale. Only small issue here is that one of Thor's helmet wing thingies is slightly askew, but only noticeable on close inspection. Black Widow is one of the better female figures in the line. The head and face are still a bit lacking in detail for what can be done at this scale but par for the course on what Hasbro is producing across it's various lines. Her eyes aren't painted as level as they could be. She's got a great rifle accessory and her belt and bracelets are nice touches. Next to Thor and Cage she looks puny, but they are the bigger males in the line. A nice addition, but I am definitely looking forward to the 6" version which is coming out later in the year. I'm not a huge fan of the Modern Age Luke Cage, although realistically I wouldn't expect him to be wearing the tiara anymore. Still, I much prefer the plain black tank top and jeans to the funky cap and hideous oversized necklace thingy, but displaying him without them has its own issues, especially on his back, where the top is barely painted on, quite a mess really. His arms and legs are also strangely mottled, and it's not clear if that's for effect or a production problem. A needed figure for the New Avengers display, but I'm glad he's tall, so he can be stood at the back. It's nice that they've started to include stands with the newer waves of these figures, but they're a bit big, and annoyingly branded with the character name which makes it harder for us OCD sufferers to swap them around and use them for the characters that need it the most. All up, while I'd prefer to be collecting my Marvel U figures in 6", I am enjoying collecting this line, and look forward to more new characters to come! You can see more pics at Facebook, discuss this at the AFB Forum, and comment on this post to enter the March AFB Comment of the Month Contest! 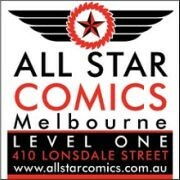 ** Not an AFB Facebook Fan? Become one now for a special second chance to win this month's contest! Out of this group I would get Thor, I really like the modern look, and Luke Cage because he is boss, though minus the lame bling and cap. I think the mottled wash on Cage is meant to imply he's wearing jeans. From a quick look at my as yet unopened Thor the wing thing doesn't seem to be there. I think this was actually a pretty good wave. The Bucky is okay, the WW2 Cap looks good (though it's really more a variant than anything else), and the Extremis IM looks better than the standard modern IM we've already had. I hear extremis Ironguy has thigh swivels, so happy dance. I find the bling funny on cage. Thor is a real standout. i like the look on thor. for the modern armour fits his current look. 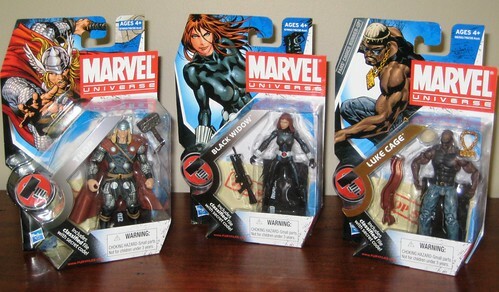 black widow nice to see hasbro giving the female marvel characters some love. Luke cage hate the gold chain makes him look more like a pimp. then power man would rather have the original look. other wise liking the line so far at least till red she hulk pops up in it. At least Luke won't forget his name with that bling! Uggghh! Thor looks pretty good. After buying a couple of Iron Man 2 figures, I realized that it's okay if I buy the occasional really good Marvel Universe figure, so I'm gonna have to find me that Thor.